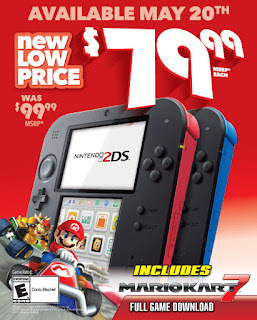 The Nintendo 2DS is one of my favorite ways to keep kids busy in the car and anytime we need portable gaming options. I was just alerted to the fact that this great buy is now even better with a MSRP of under $80! That means you can now find it at thousands of stores nationwide for less than last year. 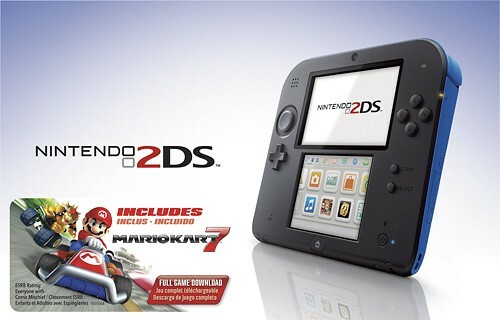 And to make the price ever sweeter, you'll find that some systems even come with a download code for the universally popular Mario Kart 7 racing game, which is the perfect gave for anyone not familiar with 2DS controls -- everyone loves this game! Like 3DS action? Look out for our review of Disney Art Academy for 3DS coming in the next 2 days!